The film God’s Not Dead was such a surprise hit that the producers were excited about the prospect of a sequel. 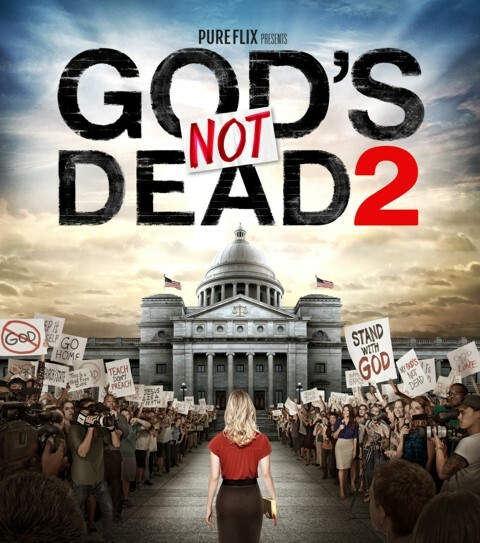 The result, God’s Not Dead 2, is, as Gov. Mike Huckabee termed it, “like ‘The Godfather 2.’ It’s one of those rare cases where the sequel is better than the first, and I thought the first movie was excellent.” The movie also serves as a wake-up call for Christian and secular viewers alike. As Gov. Huckabee put it, “The secular audience is asked, ‘Is this where you want your country to go?’ I think it is a very powerful, timely movie.” Christian viewers hopefully will be emboldened to take action and stand up for their beliefs should the situation arise. In the film, a history teacher (Melissa Joan Hart) is accused of violating a student’s rights by answering that student’s question in class wherein she compared Gandhi and Rev. Dr. Martin Luther King, Jr.’s teachings to that of Jesus. She stands accused of “preaching the gospel” in class, which results in legal proceedings when she refuses to apologize since she does not feel she has committed any wrongdoing. If any viewer thinks this scenario is overly dramatic or far-fetched, pay attention to the closing credits. Although the specifics of the case in the film were fictionalized, the credits run a shockingly long list of actual court cases which inspired the screenplay. Yet, Dr. King was a Christian minister, so does it not stand to reason that his teachings would reflect that of Jesus? The film asks why would it be okay to quote Gandhi or Dr. King, but not Jesus? One interesting point the film brings up is that some people still want to talk about Jesus’s existence in hypothetical terms, despite the fact that his existence has been proven, even by atheist scholars. No one feels the need to question the existence of other historical figures. Gov. Huckabee explained, “Jesus threatens people.” If he’s real, then they have to consider his message that He is God. As Gov. Huckabee said, “That leaves three options. He may believe He is God and is just insane. He doesn’t really believe it and is trying to pull a scam or lastly, He really is God speaking the truth. Biblical Christianity is a direct and absolute threat to the self-centered, secularistic environment in which we live. People think we need to adjust our standards to culture, rather than adjusting our culture to meet our standards.” Gov. Huckabee likened this to tuning a tuner to an out-of-tune guitar. It will not get the right results. Yet, this seems to be the direction our country is heading now that it has become acceptable to many to attack Christian beliefs. According to Gov. Huckabee, this started in the 1960s with the O’Hair case, which he termed “a bad misinterpretation of the law,” and accelerated as time went on. “At first, the impact was slow, but soon, the snowball became an avalanche. What people need to realize is these court cases are not just against Christianity; they are against civil liberty. It has become perfectly okay to be hostile toward Christians. There was an unspoken code before that it was not acceptable; now it’s almost commendable. Ours is a duplicitous society. We must accept anyone’s beliefs in the name of tolerance except Christians.” God’s Not Dead 2 demonstrates this well and provides some with a much-needed history lesson. Some of the courtroom scenes in the film use actual authors as “expert witnesses,” so some viewers may enjoy continuing the history lesson after the movie is over by checking out a book or two. Of particular interest was a non-believing Chicago cold-case detective who approached the text of the gospel like he would one of his cases. By the time he was done, he had become a Christian because he was able to prove to himself that the accounts of the Apostles were true. Gov. Huckabee hopes that is one thing people definitely take away from God’s Not Dead 2. “If you follow Jesus, one will suffer. It won’t always be easy,” as demonstrated by the teacher in the movie. But it will be worth it! Kim Frauli is a wife and stay-at-home mom of three beautiful children. She spent several years in marketing and communications for non-profit organizations, including serving as editor-in-chief of a Catholic hospital's health magazine. She took a break from full-time work in 2009 to focus on family and volunteer work, but she continued to work on freelance projects. She has served as a Sunday School superintendent and teacher, PTO president, St. Paul Booster Club officer, Girl Scout troop co-leader, youth sports coach and Woman's Club president, in addition to chairing various events for church and schools. Kim and her family live on a rural Midwestern farm with plenty of animals, including horses and cows. In addition to writing, Kim's other interests include reading, cooking, going to the movies, and cheering on her children at their various activities. Kim has written 2 articles on What Christians Want To Know! Read them in the archive below. Next post: How Does The Bible Describe Different Races Of People On Earth?